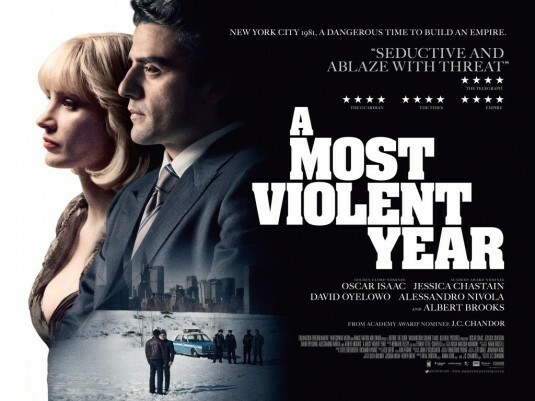 Based on its title and the Godfather-esque posters and marketing material, you could be forgiven for thinking that A Most Violent Year is something quite different to what you ultimately get with JC Chandor’s third feature as director. The title alludes to 1981 – the year in which the movie is set and statistically one of the most violent years in New York City history – rather than anything specific that takes place in the course of this story about a businessman trying to expand his operations in the face of attacks by rivals determined to undermine his success. 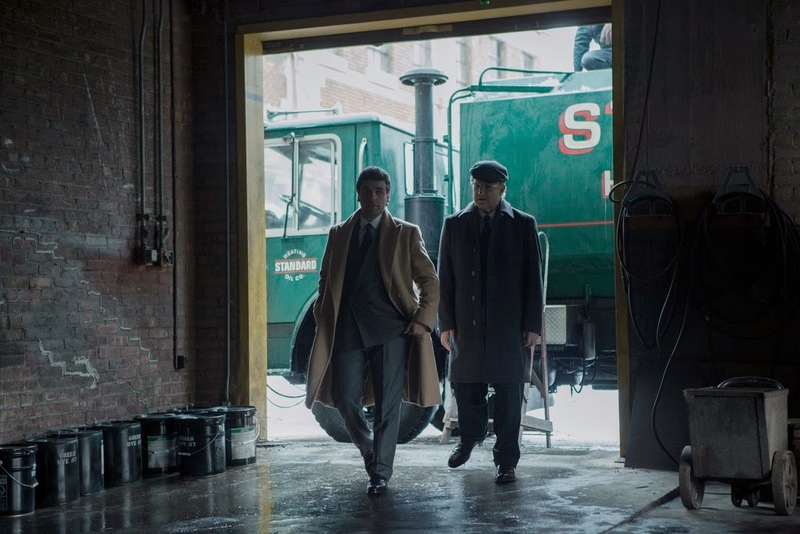 Yes, Abel Morales (Oscar Isaac) operates a heating-oil supply service that may not be entirely above board, but he is hardly a significant criminal type. Having just locked in a deal to purchase a neighbouring terminal, Morales finds himself under attack from all sides; armed thugs are hijacking his trucks and the District Attorney is investigating his company. This is a stylish, slow moving and somewhat typical entrepreneurial New York fable about an immigrant doing his darnedest to prosper in the Big Apple. For the most part, the tension here resonates from the various meetings and interactions Morales has as he tries to conjure up the millions needed to secure the terminal. He conducts himself like a gangster, more through his confident demeanor than anything he specifically says or does. In fact, he is well regarded by his employees and seems to be as much concerned about their safety as he is about the impact the attacks are having on his business. That is, until one of the employees goes off the rails and puts everything in jeopardy. The pacing is deliberate and a little off-kilter and the pressure builds as Morales encounters one setback after another. There are myriad long, master shots and there is no subtlety in the views of the Manhattan skyline that pop up at regular intervals as a symbol of Abe’s ambition. This is, after all, the city of dreams where fortune-building reigns as the pastime of choice for so many. There are a couple of terrifically executed chase sequences that enliven things somewhat, the first of which is a shootout and foot pursuit on the 59th Street Bridge. The second begins as a car chase with Morales pursuing one of his stolen trucks before eventually reaching its climax on a subway platform. These scenes are in contrast to the pace of the rest of the film, with the cinematography effectively evoking those early moments of each day; the yellowish light from a rising sun reflecting off the windscreens of the trucks as they set out each morning. Towards the end of the film there is a particularly affecting scene in which Abe, his wife Anna (Jessica Chastain) and lawyer Andrew Walsh (Albert Brooks) are standing on the snow covered dock looking across the water towards Manhattan; a moment of triumph and tranquility shattered by an unexpected act of violence. As Abe’s mobbed-up missus, Chastain is fine but doesn’t actually have all that much to do other than sashay sultrily around their mansion and threaten to take matters into her own hands while David Oyelow, hot on the heels of his lead role in Selma, impresses once again as the District Attorney. Alessandro Nivola also pops up as a rival operator, with TV regular Elyes Gabel and Colombian actress Catalina Sandino Mareno (so good in Maria Full of Grace but little seen since) also featuring. Unfortunately, there are some elements of the film that really don’t work particularly well, which is perhaps surprising given the exceptional quality of Chandor’s first two productions; Margin Call and All is Lost. For example, the Morales children seem to have been added simply as a plot convenience (finding the gun left behind by an intruder, a birthday party that delays a police search of the house) and don’t really add any emotional or narrative depth to the story. Furthermore, the police searching the house and failing to find the boxes of company documents stashed underneath seems utterly unlikely and actually elicited a few laughs of derision from the audience I watched it with. 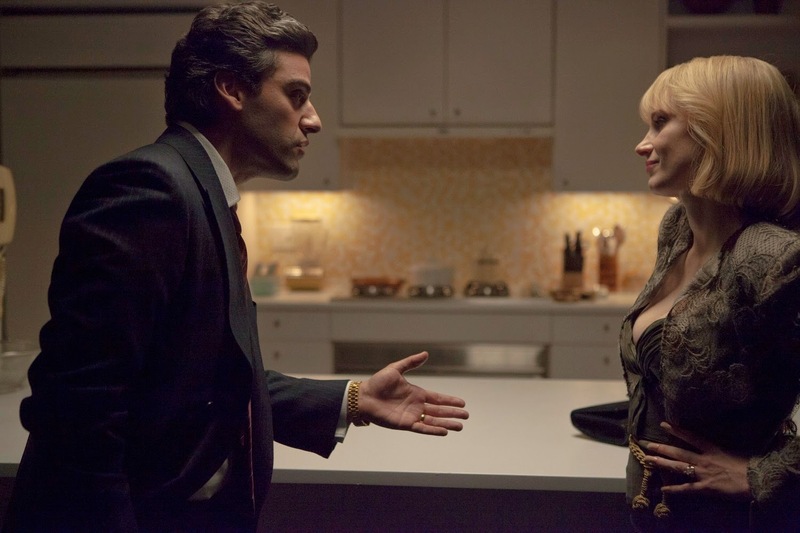 Whilst there are moments of A Most Violent Year that are impressive, ultimately it plays as Scorsese-light, both in style and content.